Since December 31st of last year, all areas within 10 meters of nurseries and kindergartens are designated non-smoking areas. 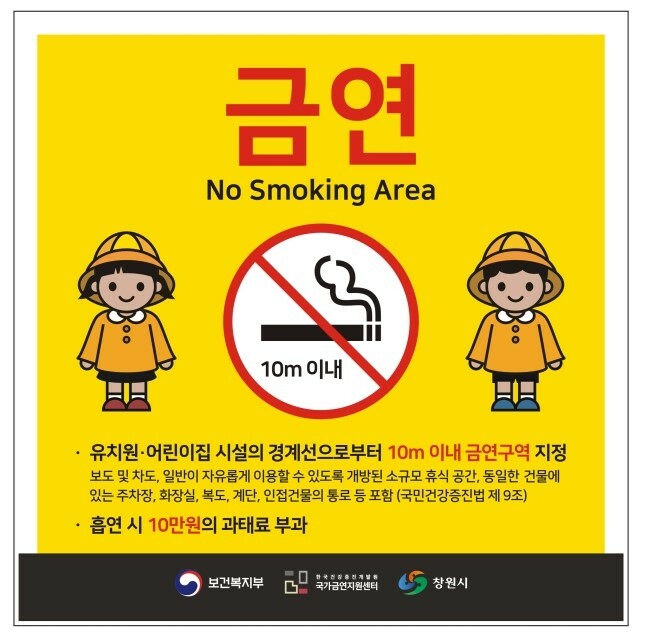 If you smoke in a non-smoking area, a penalty of 100,000 won will be fined. Until now, only the indoor spaces of nurseries, kindergartens, schools, and other childcare or teaching institutions were designated as non-smoking spaces. The Ministry of Health and Welfare explained on the 30th that "concerns about secondhand smoking in nurseries and kindergartens due to people smoking near windows and doors have led to these measures.” Each region is required to attach signs to building fences, walls, and sidewalks to indicate that the area near nurseries and kindergarten facilities are non-smoking areas.